Add a touch of luxury to your home's decor with a fur pillow from Master Furrier. Our team of furriers and tailors combines the finest materials and furs with their technical expertise to create products of unparalleled quality. The foxes used to create this item come from the Scandanavian fur producer SAGA, one of the most highly respected fur producers in the world. These furs come with the Origin Assured industry designation, which guarantees that all of the furs used in the creation of this product are of the highest quality and come from humanely treated animals. The wild silver fox (vulpes vulpes) is an independent fox species, and it is equal in size to the American red fox. The hair is denser and finer than the ordinary fox of the same region. The wild silver fox is native to North America (Labrador, British Columbia, Alaska, Canada) and Russia (Northeast Siberia). We use silver foxes from high-quality farms in Scandinavia for our silver fox fur products. The farmed silver fox (vulpes vulpes forma domestica) is characterized by the slightly longer, very silky, fine and shiny hair. The skins are purchased directly from the SAGA Furs Auction in Helsinki and Copenhagen Fur in Denmark. If you decide to buy a product from Scandinavian silver fox, you can be sure to get a high-quality natural product from excellent farmers according to European standards. 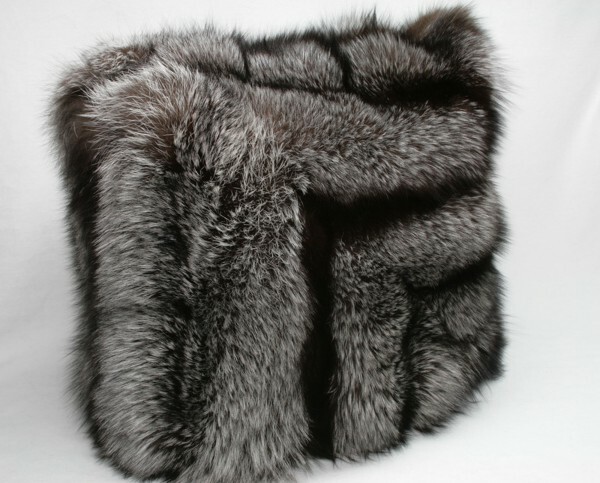 We produce silver fox fur blankets, fur pillows, and silver fox accessories. If you have any questions or requests, please do not hesitate to contact us. Related links to "Silver fox fur pillow with - SAGA"
Customer reviews for "Silver fox fur pillow with - SAGA"